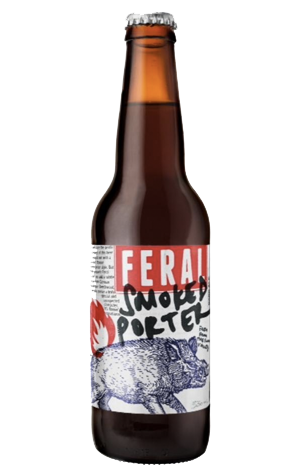 Feral has had its Smoked Porter around for a while, a brewed-occasionally number you'd regularly find at the brewery in the Swan Valley and occasionally further afield. With the large new brewery now up to speed and plenty more beer to offer up to eager mouths, it's the beer that's been chosen as the fourth member of their permanent range. It's a beer in which the smoke is rather subtle, coming from the use of German malts smoked over Birchwood chips, for those who care for such details. It adds decoration to the well balanced coffee and chocolate flavours rather than overpowering them and results in a remarkably quaffable take on the style. Or, as we said to someone at the brewery, it's "so bloody smashable". "Smashable is what we want," came the reply. "Well, as smashable as a smokey porter can be." UPDATE This original write up was based on a tasting of the draught beer on tap just prior to the packaged beer's release. Having sampled the packaged beer since then, the smoked element is more prominent, distinct even, and lingers long on the palate.